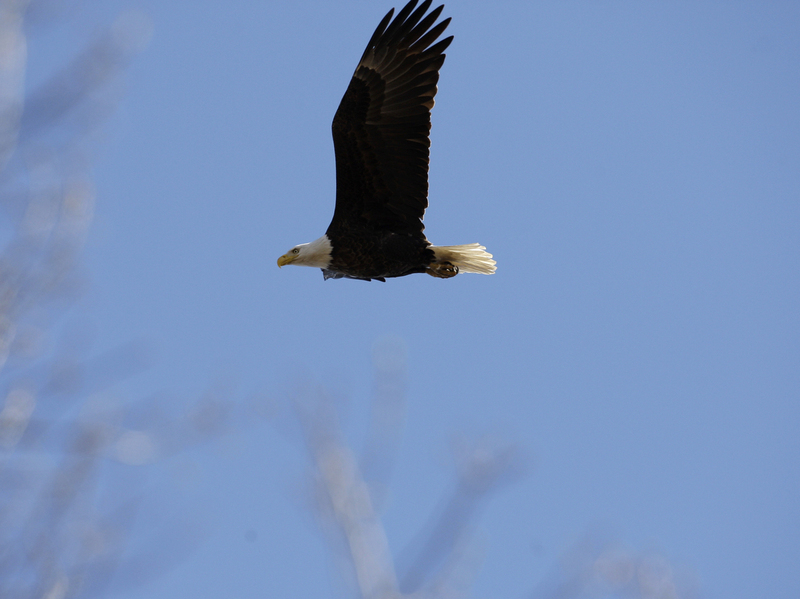 Officials Say Illegal Pesticide Caused Deaths Of 13 Bald Eagles In Maryland Authorities said there is an "epidemic on the Eastern Shore" of wildlife-poisoning crimes because it's "cheaper and easier" than trapping a nuisance animals or building a fence. 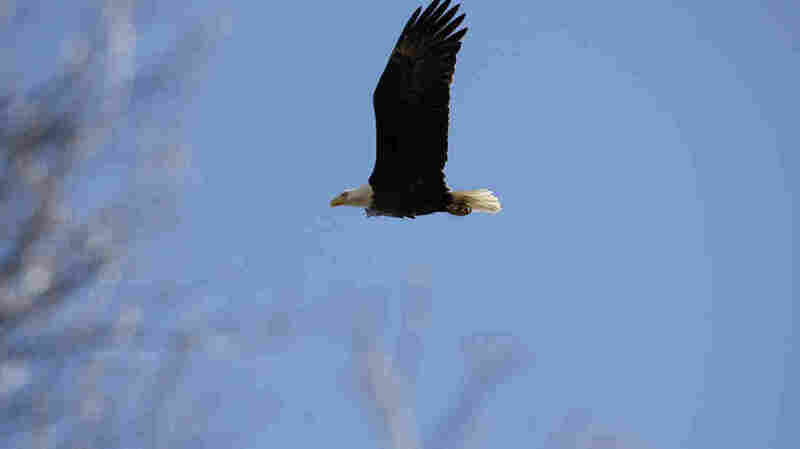 A bald eagle flies over its nest in Middle River, Md., in 2009. Robert Edgell has grown accustomed to seeing bald eagles soar over the family farm in Federalsburg, Md., so, when he discovered the carcasses of more than a dozen dead raptors on the property two years ago, he "was dumbfounded," he told The Washington Post. "Usually you see one or two soaring over the place, but to see 13 in that area and all deceased. ... In all my years, I'd not seen anything like this," Edgell said. What could have caused the destruction of so many of the birds protected under the Migratory Bird Treaty Act, he wondered? The question was taken up by U.S. Fish and Wildlife authorities, who collected six of the 13 dead eagles. Almost immediately, they suspected poisoning as the cause of death. A 2016 necropsy report only recently obtained by radio station WNAV confirmed all six died after ingesting carbofuran, a pesticide banned by the Environmental Protection Agency beginning in the 1990s. "Carbofuran was detected in the stomach and/or crop contents of all birds," the report reads, adding that the pesticide also was found in the partial carcass of a raccoon and fur recovered from the site. Researchers found that five of the six eagles had consumed a recent meal that included raccoon. Other species ingested included marsh rice rat, domestic chicken and deer. At the time the report was issued, authorities announced they were "intending to close the case in the near future due to a lack of evidence linking anyone to the crime." No arrests have been made. Killing a bald eagle a felony crime punishable by up to two years in prison and a fine of $250,000. The granular form of carbofuran was banned 1991 partly due the the devastation it wreaked on avian wildlife. Officials estimated it was responsible for killing more than a million birds that mistook the toxic insecticide for grain seeds or consumed small animals that had eaten carbouran pellets. The liquid form was banned by the EPA in 2009. "Carbofuran is so acutely toxic that animals have succumbed to it with just food in the mouth," Mourad Gabriel, co-director of the Integral Ecology Research Center, told NPR. "Sometimes we find animals where the food material is undigested — mid-esophagus." Gabriel said illegal use of the pesticide by farmers and landowners "creates a vicious cycle of death from even just one poisoning." In California, illegal marijuana growers trying to protect their crops from animals are known to set "bait piles" laced with the liquid chemical, Gabriel said. Grey foxes, bears and turkeys there often are the first victims. "Next come the vultures and other birds who consume the carrion, which later fly away and die some short distance away. Flies then lay eggs in those carcasses, which become poisoned food for other avian birds to feed on." John LaCorte, a special agent for the Fish and Wildlife Service told The Washington Post there is an "epidemic on the Eastern Shore" of wildlife-poisoning crimes because people find it "cheaper and easier" than trapping a nuisance animal or predator or building a fence. La Corte, who spent six months interviewing more than a dozen people in connection to the dead eagles, said the cases are hard to solve because there rarely any witnesses, if any. "If anyone wants to see things get done about this, they need to be courageous and come forward," he said.